Heat oven to 350°F. Line 2 cookie sheets with foil; spray foil with cooking spray. Spread coconut in ungreased shallow pan. Bake uncovered 10 to 12 minutes, stirring occasionally, until golden brown. Cool completely. Reserve 2 tablespoons for garnish. In 1-quart saucepan, cook caramels and water over low heat, stirring constantly, until caramels are completely melted. Transfer to medium bowl; cool 5 minutes. Add frosting to melted caramels; stir to combine. Stir in remaining coconut and graham cracker crumbs. Drop mixture by rounded tablespoonfuls onto one of the cookie sheets. Refrigerate 15 minutes; shape into balls. (If mixture is too sticky, refrigerate a few minutes longer until firm enough to shape.) Freeze 30 minutes. In small microwavable bowl, microwave chocolate chips and shortening uncovered on High 1 minute 30 seconds; stir. If necessary, continue microwaving and stirring in 15-second intervals until melted and smooth. 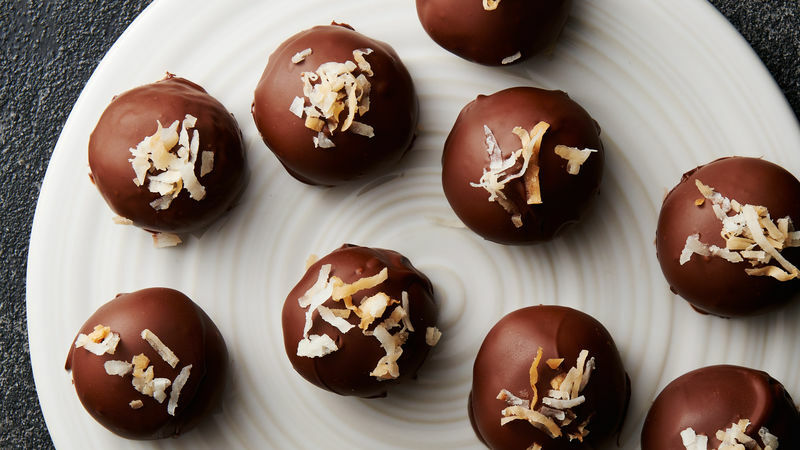 Dip truffles, one at a time, into chocolate. Place on second cookie sheet. Immediately sprinkle some of the truffles with reserved toasted coconut. Refrigerate truffles about 10 minutes or until coating is set. Store in tightly covered container in refrigerator up to 1 week. Remove from refrigerator about 30 minutes before serving. Letting the caramel cool for a few minutes helps to ensure it won’t overheat the frosting, which might make the filling oily. Melting the caramels on the stove on low heat, stirring constantly, allows the caramels to melt evenly. Melting them in the microwave in a bowl may cause them to burn in spots if the microwave heats more intensely in some parts of the oven.